Extremely pale butter-colour with a satin sheen. Ochre yellow duochrome with pink shimmers. Intense grey duochrome with bronze satin sheen. Dark aubergine purple with warm undertones. Delicate lavender purple, looks magnificent on dark eyes. Pastel blue with cold undertones. 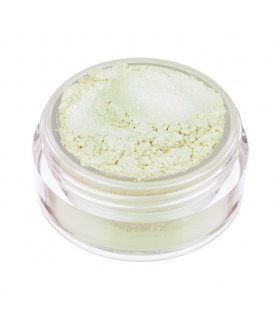 Transparent crystal powder with exotic lime green shimmers.